“Playing politics is easy; governing effectively is hard. As Chief Executive, I take my responsibilities on behalf of the people of Maine seriously. “The governor certainly has changed the tone in Augusta. He has made politics one of the most contentious and divided in our state’s history. He has vetoed more bills than any other governor, he has lobbed insults that require censorship on TV, and he has continued to put his stubbornness ahead of the best interests of Maine people. We deserve better than this. Audio link and link to address as shared by the governor’s office. Maine’s first 126th Legislative session was plagued by misguided priorities and political games. Democratic leadership chose their strategy, which was to attack and delay. Hello. 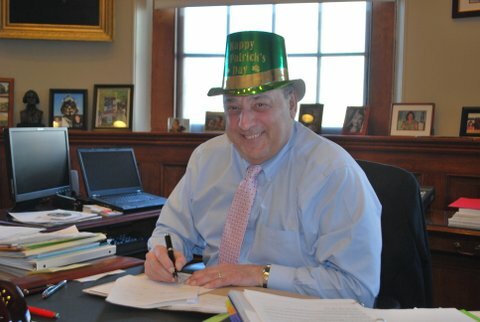 This is Governor Paul R. LePage. There are nearly 500 new bills that will become law in October or earlier as a result of this session. In one of the most appalling moves of the session, however, some Democrats took a stand against the Administration at the expense of our military men and women. A Governor’s bill was submitted supporting Maine’s uniformed military members having access to public schools. Military recruiters told our Administration several schools in southern Maine only allow minimal access of recruiters. Those high schools brought to our attention were Oak Hill, Noble, Wells, York, Kennebunk, Gorham and Yarmouth. We also were informed that two additional high schools, Portland and Yarmouth, refused uniformed recruiters from stepping on campus. Democrats have claimed there is no problem, but in the same breath some Democrats have said uniformed military service members may intimidate high school students. So, the father or mother who arrives in uniform to pick up their child from school is threatening? The thought is preposterous. I’d bet my life on the word of a recruiter over a superintendent any day of the week and twice on Sunday. As I prepare to go to Gettysburg, I am disgusted by these behaviors. The Democrats blatant rejection of this bill sends a message to all military service members – past and present – that they are not welcome in Maine’s public school system. The disdain is evident and it is a sad day for Maine when we cannot come together in agreement to support our troops. Maine has a proud and long-standing tradition of service to our state and country. We have the largest number of veterans per capita in the nation and we owe our heartfelt gratitude to our troops who defend our freedom and sacrifice time with their family, friends and communities to serve. NOTE: It is well known that our governor himself, unlike many men of his age, was not in the military during Vietnam and in fact, was living in New Brunswick raising his first family at the time. Paul LePage never served in the military in any capacity and has in fact been a harsh critic on numerous occasions of our nation’s Commander-in-Chief, President Barack Obama. 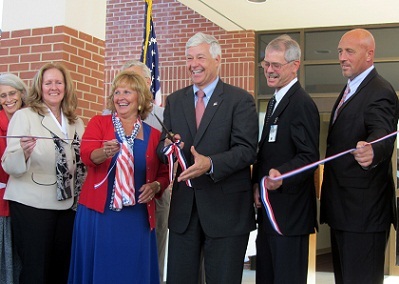 Maine’s First Lady Ann LePage attends VA ribbon cutting ceremony in Lewiston with US Congressman Rep. Mike Michaud, who is now running for her husband’s office in 2014. Repeatedly the job of honoring Maine’s citizens who have served their country has fallen to First Lady Ann LePage, who has done a far better job of representing our state well than her husband ever could; our state is and should be grateful for and proud of our First Lady’s tireless work. That Governor LePage is speaking up so strongly is just another example of odd and inappropriate behavior, which the state has gotten rather used to over the course of his tenure. Priest is a Navy veteran who earned a Bronze Star for his service in the Republic of Vietnam in 1970 and 1971. “This bill is a solution in search of a problem that doesn’t appear to exist. We want our military to succeed and we also want to leave decisions to educators and parents in keeping with our time-honored tradition of home rule,” said Rep. Bruce MacDonald, D-Boothbay, the committee’s House chair. Military service is not for everyone and this bill did nothing to force students into serving. It simply forbade school administrators from refusing recruiters in uniform to visit with students interested in exploring life’s options. I encourage Mainers to find out where politicians stand on this important common sense bill before they cast their next vote. I assure you that this will not be the last time this bill is introduced. NOTE: Um… who’s zooming who? His own PARTY offered their own late budget, as it became readily apparent that the LePage budget was set to force municipalities to raise taxes on every Mainer, to counter the unfunded $400 million tax cuts to the wealthy passed by the GOP led 125th Legislature. 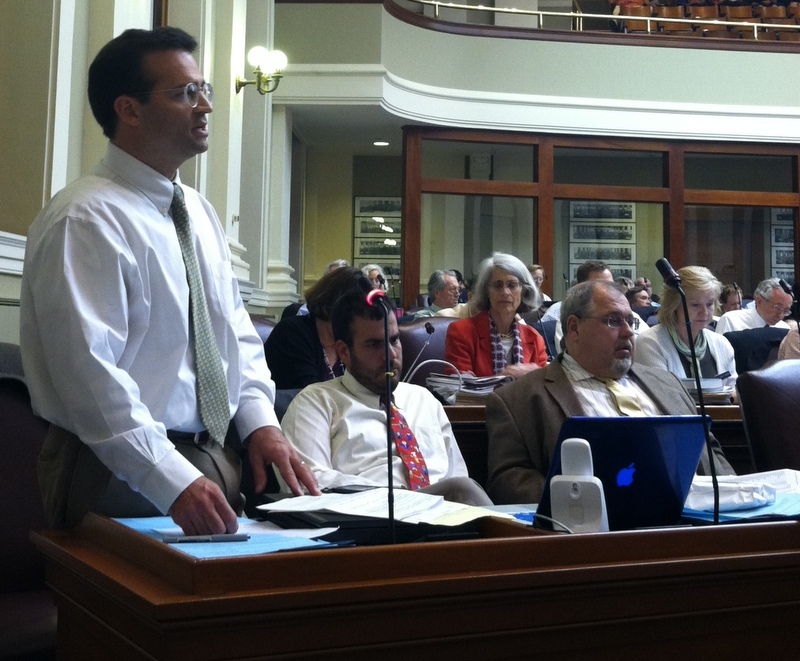 “Yesterday, legislative Republicans acknowledged the need to break with the governor and restore $368 million to the state budget in order to avoid property tax increases on hardworking Maine families,” Martin said. “Some of the most conservative members of the Republican Party joined in this appeal that includes new revenue. MECEP has maintained all along that Maine working families need a budget that funds our schools, protects our elderly and disabled, and gives our economy a boost without crushing property tax increases. Republican admission that additional revenues are needed to balance the budget is a step in the right direction. I don’t know what Mainers will remember most about this first session. Perhaps it’s the recruiter bill or maybe that the hospital welfare debt was finally paid. Quite frankly, the tax increases disturb me the most. And the way I look at it: the 126th isn’t over yet. So, in January we will have a plan. 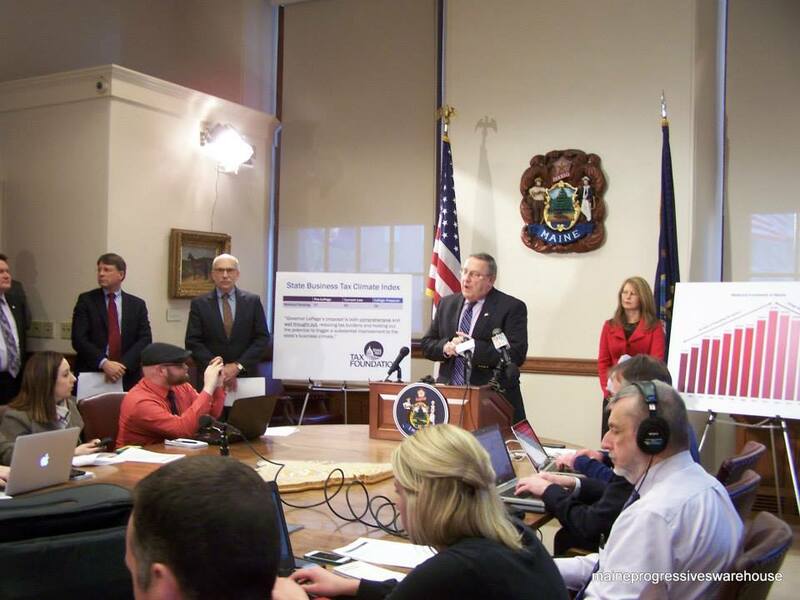 A plan that repeals the tax increases and is designed to move Maine forward. The question is will Democrats choose to fight against me again or work for the Maine people. Originally posted Jun 27 and now bumped back to top, as news has come out tonight that Maine’s self-proclaimed “blue collar” Governor Paul LePage, who last week denounced the state’s “country club Legislature” and said that he would be discussing options with his family regarding whether or not to run for re-election, announced before a hundred supporters at the posh Jeb Bush hosted, up to $3k per couple Nonantum Resort, Kennebunkport fundraiser that he is indeed running for re-election in 2014. “Just a quick email reminder that tonight’s LePage event in Kennebunkport is closed press. There are no press avails before or after the event. UPDATED with earlier portion of the press conference that I missed; many thanks to PPH’s Steve Mistler. UPDATE x2: Friday’s Portland Press Herald is chock-full of scathing missives today in Letters to the Editor: Governor disrespects people he serves. He said the Legislature is a “country club” where lawmakers are more interested in getting along with each other than with him. LePage said he would be consulting more with his family before deciding whether he would seek a second term as governor. During the press conference, the Governor repeatedly called his originally submitted budget “a good budget” (so good that the silence from his caucus’ after the State of the State address was deafening) and repeatedly backtracked on his 2009 stance regarding revenue sharing. LePage was critical of the Democrats in leadership who would not talk to him about the budget, again called out the Appropriations Committee for not allowing him to speak on mic, in particular the Republicans on the committee and then called out House Minority Leader Ken Fredette (R-Newport) as “having not been around” to talk with or had been “unwilling to talk to me”, that the Republican Party is not a strong one currently in Maine, and was unaware that the energy omnibus bill that he had vetoed had been overturned in the House and heading for the Senate. It needs to be noted that while many communities denounced the Governor’s budget, not a single one even attempted to pass a resolution supporting LePage, a point raised by Senate President Justin Alfond (D-Cumberland) during this week’s Democratic leadership media availability event. But apparently the coverage was not sufficient for the Governor, as he decided to declare yesterday’s disaster a “mulligan” and try again to explain himself to the Maine people, today going before the camera once more, with his office releasing the following footage this afternoon. Governor Paul R. LePage speaks out about why he could not support the Legislature’s budget, which included tax increases, in a new video released by the Office of the Governor. In the five-minute video, the Governor shares his thoughts about how higher taxes will affect Mainers and condemns decreased funding to programs like Jobs for Maine Graduates. In the video, he notes that tax increases will have a devastating effect on the elderly and Mainers who live within their own budgets. Sales, meals and lodging taxes will be increased to fund the state budget. 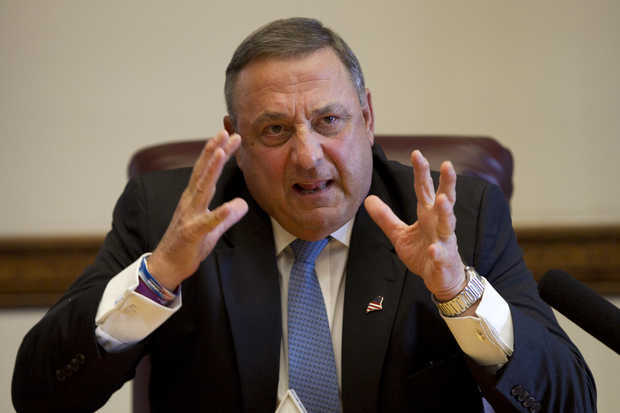 “Retired mill workers living on fixed incomes; elderly widows collecting Social Security; and our veterans, who receive nothing more than their military pension—each of them care about this tax increase,” Governor LePage said. Harder thrown pitches than these can be seen at a playground Whiffle ball game… Now, I love a good train wreck sort of news story as much as the next person, but this is just getting sad. In his opening statement, The Governor claims “not to be a politician and be a blue collar governor”. Gotta call a 1 stroke penalty for this one! Then there is this: “Gov. LePage’s recent actions cry out for an intervention”. That one by Senate Assistant Minority Leader Roger Katz (R-Kennebec) even made it into the Washington Post: Top Maine Republican legislator: ‘I am embarrassed’ by LePage. Heh. 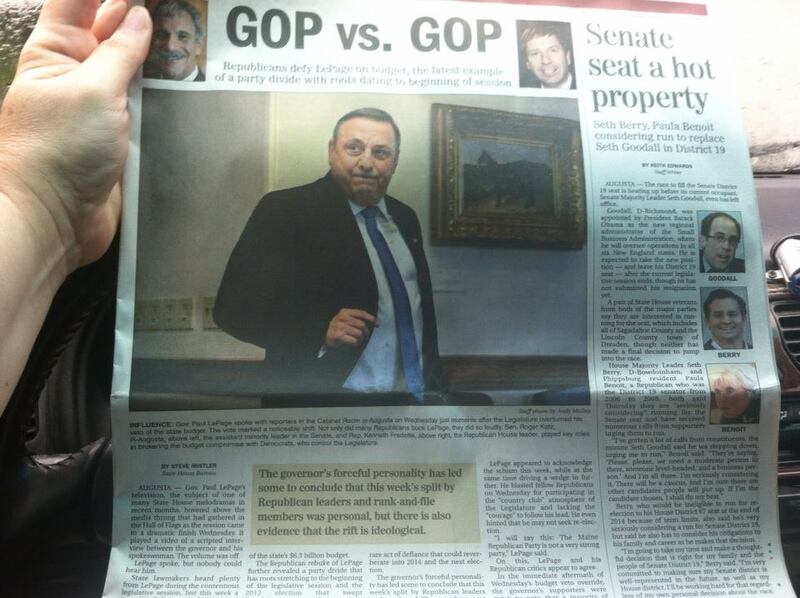 Wonder how Minority Leader Mike Thibodeau (R-Waldo) feels about that (“Top Republican”) interesting mistype? An argument could possibly be made that the Governor sees himself as having a “Tin Cup” moment, but the reality here is indeed something entirely different. Same as with their counterparts in the Senate, the House Republicans had nothing to say regarding the veto override vote (roll call). 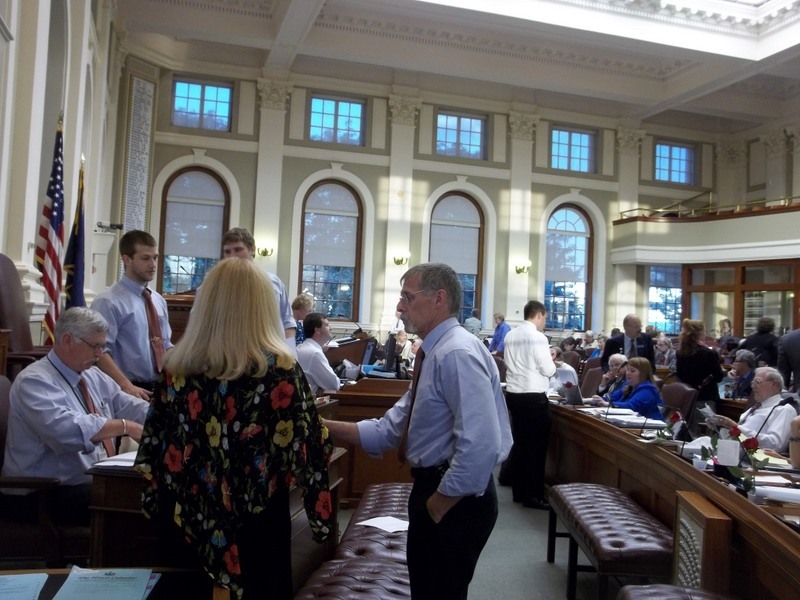 The House Chair of the Appropriations and Financial Affairs Committee, Rep. Peggy Rotundo, D-Lewiston, said the vote affirmed the “collaborative and responsible” work of the budget committee. “The bipartisan budget we again endorsed today will serve the people of Maine well. A government shutdown would not serve anyone,” said Rotundo. “I applaud lawmakers on both sides of the aisle for standing up to the governor’s reckless action and standing up for Maine people. The governor’s political games could have led to serious consequences: a shutdown of important services, property tax hikes, harm to workers and the health of our economy,” said House Majority Leader Seth Berry of Bowdoinham. “No one got everything they wanted out of this compromise budget, but lawmakers were able to find common ground through hard work. They came together once again today for the well-being of our people and our state,” said Assistant House Majority Leader Jeff McCabe of Skowhegan. Here is the order of speakers are the floor speeches from last week. My fellow Mainers, as many of you may know, I grew up on the streets, and I’m a blue-collar Governor. I’m not a politician, and I tell it like it is. Some say my language is colorful and refreshing. Others say it is rough and offensive. If I have offended anyone, I apologize. But folks, it is time to wake up. Sometimes the only way I can get your attention is to use straight talk. Over the years, I’ve been criticized for my comments about the President and the dangers of the federal government growing too large and too powerful. Since then, we have seen an administration embroiled in scandals over the IRS, Benghazi, drones, spying on the press and gun-running. Talk about offensive! And that doesn’t even include the 17 trillion dollars in national debt or a health insurance mandate that will crush the life out of the economy. Some of my comments about politics in Augusta have also caused outrage. If the Maine people saw what really happens under the dome, they would be outraged too. Politicians, lobbyists, unions and special interests ignore what is best for Mainers and fight to maintain the status quo. They work overtime to expand welfare and to grow government, and they will gladly increase your taxes to pay for it. They would rather enact a bad budget that harms Mainers than make the hard choices and face the consequences at the next election. I find that obscene. I proposed legislation that would reduce electricity costs for everyone, decrease taxes, reform welfare, create jobs and improve education. These proposals would benefit all Mainers. But politicians work around the clock to kill common-sense legislation, just because I proposed it. They would rather ignore the best interests of Maine people than see the Governor get good legislation passed. That is truly offensive. Being hateful toward me is one thing. But punishing Mainers just to see me lose is absolutely disgraceful. One Democratic leader told the media that it doesn’t matter what the Governor does because they have the votes to override the budget veto. This kind of obstructionist has no place doing the people’s business. 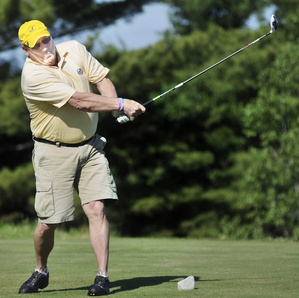 They come to Augusta to keep score for political losses and wins, not to do what’s right for the Maine people. You won’t see these stories in the media. When the politicians step in front of the cameras, they say they are seeking bipartisan solutions to improve the lives of Mainers. Sounds good. Then they turn around, ignore the Maine people and get back to their score sheets. Folks, if you believe the status quo is working, then you are sadly mistaken. I might have to use some street talk to wake you up. Politicians strive to be politically correct and end up doing the wrong things. I’m not politically correct, but we strive to present good public policy. I worked in the private sector as a successful turn-around consultant for failing businesses. I see our state as a failing organization in need of a turn-around. It will take tough decisions and bold moves to eject Maine from its status as one of the nation’s highest-taxed states and the 50th worse place to do business. It’s not a job for the weak or faint-hearted. But Augusta is full of politicians who refuse to reduce the size of government. They refuse to improve education, and they absolutely refuse to reform welfare. They won’t consider resources that would reduce the cost of electricity for everyone. They won’t even attempt to lower your taxes. Yes, folks, this makes me mad. And it should make you mad, too. I came to Augusta to make a difference in the lives of Mainers, not to count votes and compromise my principles. 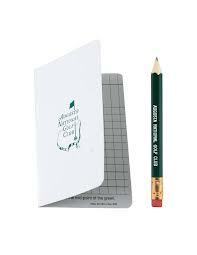 I’ve told my Cabinet that if we are in Augusta only to get re-elected, we are in the wrong business. We are not here to get through the next election; we are here to protect the next generation. With so many bills being taken up in the waning days of the first half of the 126th Legislative session, it is impossible to write each bill up properly- things happen fast and furious in Augusta and quite often, one feels like a ping pong ball bouncing back and forth between the Chambers and wishes for roller skates to cover as much activity, debates, press conferences and news stories as possible! This is as appropriate a time as any to thank the dedicated staffs in both chambers, the clerks, aides and more for both parties- these people do a tremendous job behind the scenes to ensure that the complicated processes at play in making laws are done in as orderly a fashion as possible, right down to the IT folks running the wireless networking within the building and dealing with the occasional non-working lights on the boards. So with this in mind, let’s quickly try to cover what we can before the 126th comes back in tomorrow! First off, we have this handy list from the Governor’s office of bills either signed, allowed to pass without his signature or vetoed- with those vetoes come specific messages to the Legislature. Governor LePage has now issued at least a dozen vetoes this past week alone and as such, the bills each now face more votes in both the House and Senate for override of the veto or to sustain the Governor’s veto. 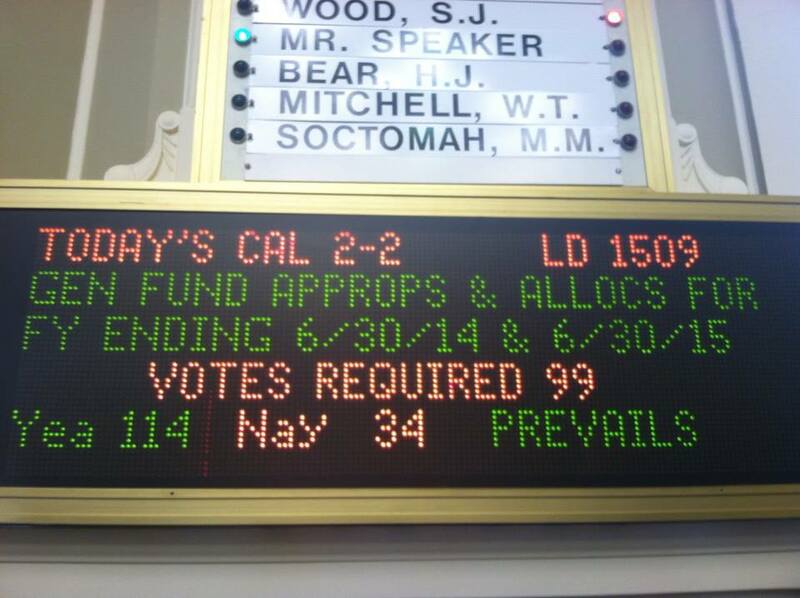 Yesterday as earlier reported, the Governor as expected vetoed LD 1509, “An Act Making Unified Appropriations and Allocations for the Expenditures of State Government, General Fund and Other Funds and Changing Certain Provisions of the Law Necessary to the Proper Operations of State Government for the Fiscal Years Ending June 30, 2014 and June 30, 2015”. This vote will certainly be “the one to watch” tomorrow, as both chambers sent the bill to the Governor with super majority tallies and failure to pass the bill will result in a statewide government shutdown starting on July 1. Here is the Governor’s letter. Another bill that was vetoed at 11:55pm on the last mandatory Legislative session day by statute (June 19) and worth watching for tomorrow is the energy omnibus bill, LD 1559, “An Act To Reduce Energy Costs, Increase Energy Efficiency, Promote Electric System Reliability and Protect the Environment”. 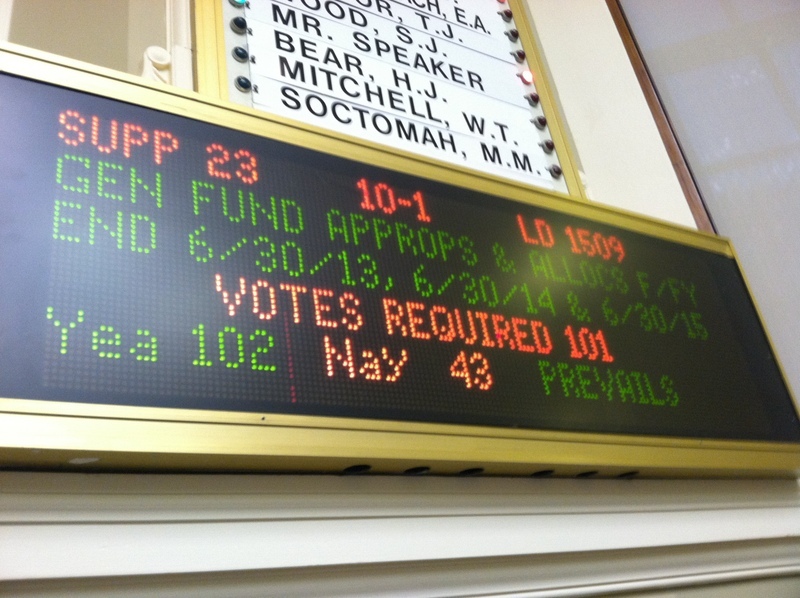 But moments after the veto was signed, the House reconvened and voted 121-11 to override the veto. It next goes before the Senate, who had adjourned for the evening when the bill passed the House and as such, were unable to immediately take it up themselves. Democratic leaders issued statements, which are posted below. 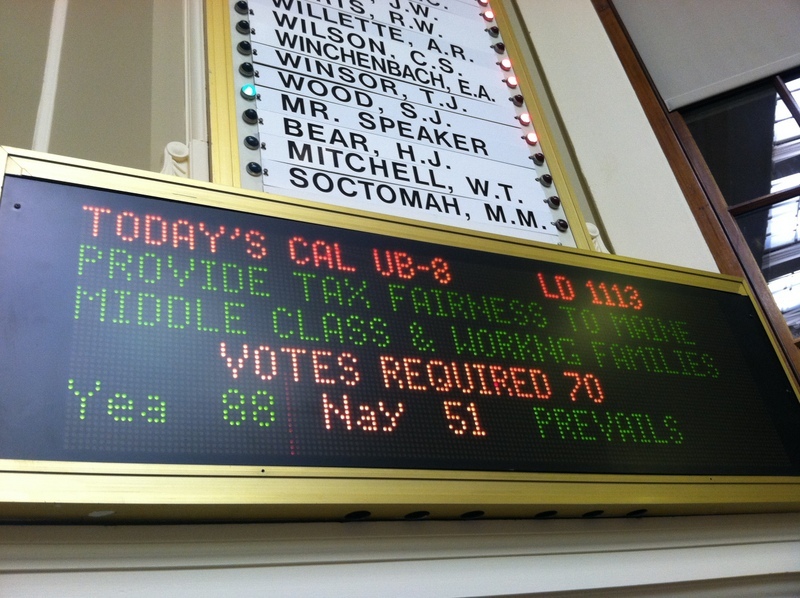 It should be noted that the Senate originally passed LD 1559 by a 28-7 vote. Here is the Governor’s veto letter for LD 1559. Also before the Legislature are the stack of bills (PDF warning) on the special Appropriations and Financial Affairs Committee table; ie, the bills deemed to have expenses added to them that before enactment, need to be figured out as far as potential costs and financial impacts. As there are 32 pages’ worth and well over 100 bills, there is no way yet of knowing how many will be dealt with tomorrow or which ones will be set aside for the second half of the session.